We launched some improvements to our service this week that we’d like to put in the spotlight here. We’re accepting new source formats, offering new ways to move your data to BigML, and enabling descriptions and tags for sources, datasets, models and predictions. On the visualization end, we’re introducing a great way to filter your predictive models to get the most of them. We know that you love our drag-and-drop uploading source files functionality. But, you don’t want to drag around (big) data if it isn’t really necessary. That’s why you can now create a remote source via a URL. Just let us know where your data is and we’ll get it for you! 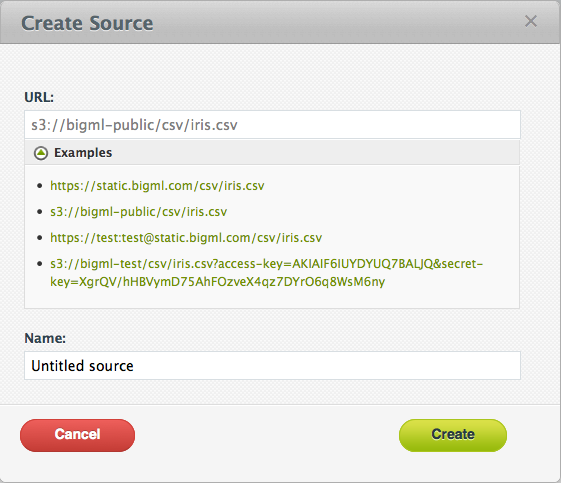 BigML works with https URLs and also with basic realm authentication. Thus you can make sure that the transmission of your data from its origin to our servers is secured. If your data is on Amazon’s S3, you can link to your bucket and we’ll get it from there. If you have your data in a spreadsheet, you no longer have to export it to a .csv file. You can directly drop your data into our website and get started, making your access to machine learning another click faster! For best results, avoid spreadsheets with multiple tables. Did you know that we also accept these files as .gzip files? As you work with various versions of your sources, datasets, models and even predictions, you may want to add some information to each of these resources. You now can add a description, tags and a category to each item. Simply click the icon and type whatever things you need to remember about this resource. You’ve built a great model and are ready to explore it. You already can go branch by branch to see what values are predicted where. But, what if you’re only interested in certain outcomes? 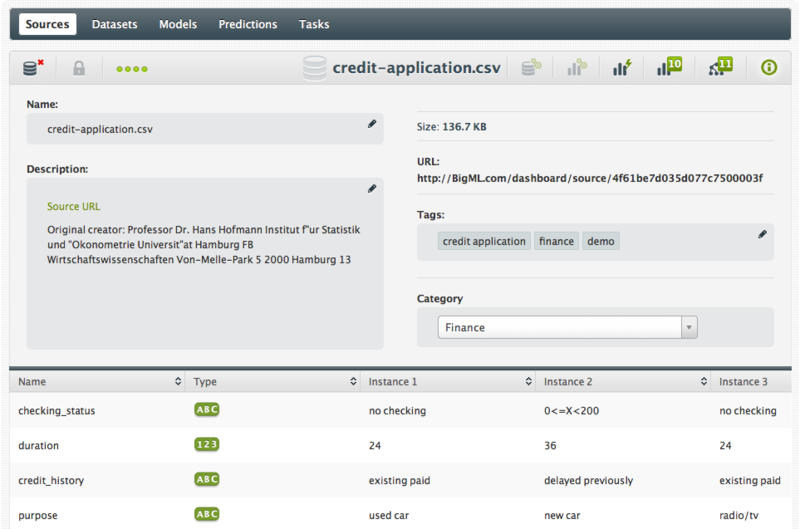 Now gaining these insights from your model is much simpler. If your predictive model is for classification, simply select the class that you want to filter on (e.g. 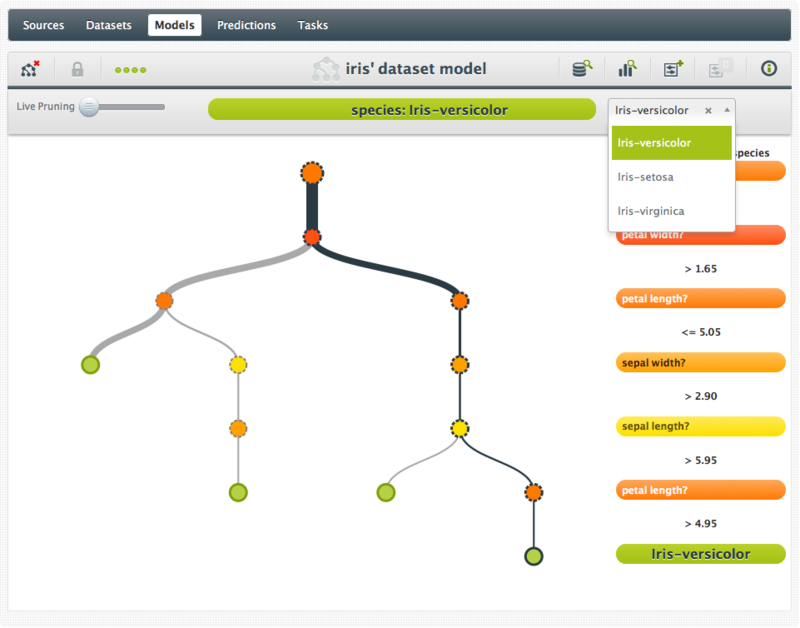 show all parts of the tree that predict ‘iris-versicolor’ for Species). If your predictive model is for regression, you use sliders to indicate the range of values you want the tree to show (e.g. show where the model predicts an income between 25,000 and 30,000). The model is now reduced to those parts that have the selected values as intermediate or final prediction. You can see how this filter actually works in the models in our Model Gallery. As we continue to improve and expand our services, do let us know what you think! We love to hear from you.